The halogens are located on the right side of the modern periodic table before the inert gases , The halogens are elements of group 7 A ( 17 ) in p-block , The halogens are mono-valent elements as their outermost energy levels have ( 7 ) electrons . The properties of the halogens . The halogens exist in the form of diatomic molecules ( they are formed of two atoms ) , The halogens tend to gain one electron during the chemical reaction , and convert into negative ion which has one negative charge . Halogens are formed of two atoms . They are diatomic molecules . The physical state of the halogens is graduated from the gas to the liquid to the solid . 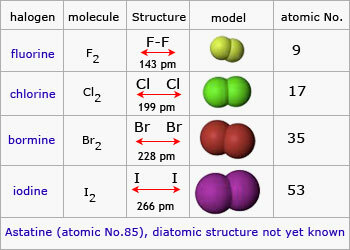 Fluorine and Chlorine are the gases , Bromine is a liquid , and Iodine is a solid . The halogens react with the metals forming the salts , So , they are called the halogens which means ” Forming the salts ” . The halogens are the active elements therefore they do not exist in the nature in the elementary state , but they are found combining with the other elements forming the chemical compounds ( except Astatine ( At ) which is prepared artificially ) . Each element of the halogens replaces the element below it in its salt solution .